The Export to EDL/AAF/XML window allows you to export your animatic into a video editing sequence which you can import in Non-Linear Editing (NLE) software such as Apple Final Cut Pro, Adobe Premiere, Avid Xpress, Avid Media Composer or Sony Vegas. The timing, motions, and sound clips in your project are preserved. NOTE See Exporting an EDL, AAF or XML Sequence to learn how to use this feature. Movie clips can be exported in Windows Media Video (*.wmv) format on Windows and in QuickTime Movie (*.mov) format on either Windows or Mac OS if QuickTime Player is installed. This option can not be changed if only one movie format is available for export. Click this button to configure the video settings. 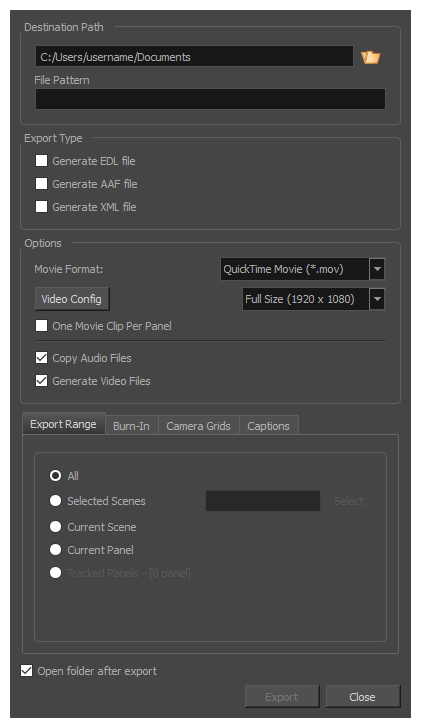 When exporting in QuickTime, this allows to set the video codec, framerate and quality. When exporting in WindowsMedia Video allows to set the video bit rate and variable bit rate quality.The resolution drop-down right of the Video Config button can be used to define the output resolution, since you might not always need to export the storyboard at full resolution. You can select Full, Half or Quarter of a project’s resolution. When enabled, the project’s sound files are copied to the same directory as the EDL/XML/AAF files and the video files when exporting. Sound clips that are used several times in the project will only be copied once and linked to several times in the EDL/XML/AAF sequence. Disabling this option can be useful if you are overwriting a previous EDL/XML/AAF export of your project and have not made changes to the sound clips in your project, as it will make the export faster.